It was one of the biggest sports stories of the year: the New England Patriots, caught video-taping a rival team's coaches as they sent signals to their players. This week, a former employee said the Patriots had been doing it for years. Now, the team's head coach is answering back, in an exclusive interview with CBS News chief investigative correspondent Armen Keteyian. In the latest episode of the NFL's "Spy-gate," a defiant Bill Belichick decided to break his silence today to challenge the charges and motives of former Patriot's video operator Matt Walsh. "There was no deception," Belichick said. It was Walsh who shot video during Belichick's first two seasons in New England in 2000 and 2001. He went public this week, calling the coach "arrogant." Walsh claims Belichick's contention that he just "misinterpreted" the rules was false and that the taping was actually a deliberate, illicit scheme by the Patriots to cheat their way to victory. 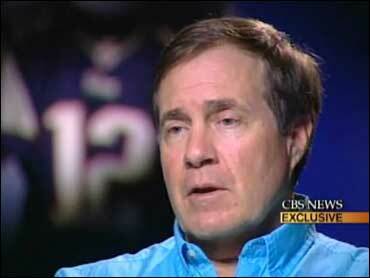 Today, in an exclusive interview with CBS News, Belichick fired back at Walsh's. "I don't know what his agenda is, and again, he was fired for poor job performance," Belichick said. "There's not a lot of credibility. You know he's tried to make it seem like we're buddies and belong to the same book club and all that. And that's really a long, long stretch." Belichick says Walsh was in no position to know. "For him to talk about game-planning and strategy and play-calling and how he advised co-ordinators, is - it's embarrassing; it's absurd," Belichick said. "He didn't have any knowledge of football. He was our third video assistant." During Walsh's entire time with the team, Belichick said he operated under the belief that the NFL's bible - its constitution and bylaws - allowed taping as long as it wasn't used to aid a team during the playing of a game. He says Walsh was instructed to shoot the game, including hand signals, in plain sight, wearing Patriots gear. And he provided the video to the league - and CBS News - as evidence. "Why would Matt Walsh say he was told by his superiors to avoid detection, not wear Patriots clothing, and to lie about what he was shooting?" Keteyian asked Belichick. "I never told anybody to do that," Belichick said. "All I can tell you is what the facts are. You look at the tape. You see him filming the game. You tell me how discreet it is." Belichick acknowledged when the rule was clarified by the league in September, 2006 - outlawing "videotaping of any type" during a game, he stepped over the line. "Bill, you got the memo," Keteyian said. "I mean, you couldn't be any more clear than…"
"I made a mistake," Belichick said. "I was wrong. I was wrong." In the end, "spy-gate" will not likely be remembered for illegal tapes or even Matt Walsh, but for its impact on the legacy of a three-time Super Bowl champion coach and how his team achieved greatness. "People have said you flat-out cheated," Keteyian said. "What do you say to those people?" "What I've said to you," Belichick said. "I told you the truth."